The post war (1992-1995) socio-economic situation is troubled and recovery is slow. Bosnia and Herzegovina still struggles with poverty. Organised crime syndicates thrive and prohibit the country from joining the EU. The “brain and youth drain” sap Bosnia’s potential; 60% of young people want to leave the country. Pray for economic transformation and for a new generation of Bosnians to stay and help the country to develop. Pray for God to bring deep healing and reconciliation from the hurt and divisions created during the war. Pray for a spiritual awakening – for people to come to faith in Jesus Christ, in a country where only 0.1% of the population are evangelical Christians. 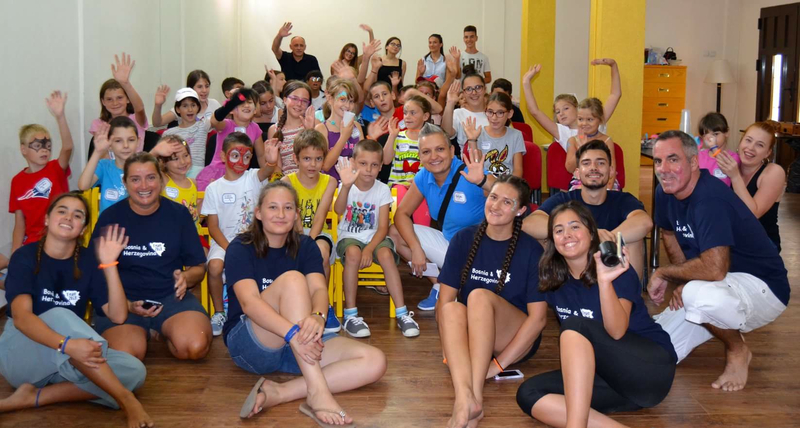 Pray for the summer camps 2019, where children and young people will have the opportunity to hear the gospel. For many years, OM Bosnia in Bihać has run a winter firewood project with the local evangelical church to help struggling families with much-needed firewood and a food package. At the same time, they hope to introduce them to the love of Jesus. Ninety-five per cent of the population of Bihać are from a Muslim background, and there’s only one church in the county. Many become depressed because of their worsening financial situations and they find that their religious leaders provide little hope. In January, about 25 people from local families attended an evening of dinner and fellowship at the local church. As well as singing songs, drinking coffee and eating homemade food, they heard a clear message from Faruk*, a Muslim background believer who knows both the Qur'an and the Bible well. Give thanks with the OM team that, little by little, God is softening the hearts of people in the town. There is a dire spiritual situation in Bosnia and Croatia: churches are sparse, evangelical believers are few, and apathy to the gospel reigns. There are less than ten thousand evangelical Christians in Croatia and less than five hundred in Bosnia! Some churches really want to make a difference but often they have few resources at their disposal. Many feel it will take up to fifty years to see new churches develop in their areas. That is too long for the eight million people in Bosnia and Croatia to wait. Please pray for visionary local leaders and churches to plant new churches and to reach the lost in their areas and for God to be at work powerfully by His Spirit. Bosnian allegiance to Islam came about as a result of 500 years of Turkish occupation, which means that evangelical witness is small. Prior to 1991 there were only two or three known congregations in Sarajevo. By 2000, this number increased to 29, some fellowships in places where the worst atrocities had taken place, and with about 500 people attending services. However, these infant fellowships are by no means strong. Churches started in Bosnia after the end of the war in 1995, with dozens of mission workers coming in under the umbrella of Christian NGOs. A lot of people became Christians based on the benefits they perceived in doing so. Today, many of these people still find it difficult to be self-confident in the Lord and in His provision. The true situation today is a stagnant church with little or no growth. Please pray for a spiritual awakening in Bosnia. Three lively churches, two in Croatia (Dubrava and Varaždin), and one in Bosnia (Novi Travnik), aim to start planting a total of 10 new churches over the next 5 years - a great undertaking. In order to do this they intend to mobilise 12 Brazilian missionaries and 4 Ukranian missionaries, who will greatly speed up the process. They are planning special worldwide prayer evenings for ‘Revival in the Balkans’, during Pentecost (8th-12th June) when they will seek to encourage and facilitate evenings of prayer, and hope to have people participating from Korea to Ukraine, Britain to Brazil, America to Australia, and everywhere in between! Pray for many new Christians and new churches, for finances and vision of the workers from Brazil and Ukraine, and for both the existing church planting zones (Dubrava and Varaždin from Croatia and Novi Travnik in Bosnia) and the possibility of identifying more in Croatia, Slovenia and Serbia. There are few activities available to young people in Dobrinja, Bosnia. Knowing this, The House was launched recently: a comfortable space for teens complete with a PlayStation 2, sound system, books, guitars, snacks and a projector. During the first week, only a few teens showed up, but now about 10-15 young people, mainly guys, come to The House. Pray that this space would be a refuge for young people who have nothing else to do, and that they would be led to Christ through what they find there. Bosnia sits on the cultural divide between East and West. The country’s population consists of relatively even numbers of Bosnians, Croats and Serbs, and consequently it suffered terribly during the civil war in the 1990’s. It is estimated that 250,000 people were killed in the fighting and ethnic cleansing. This has left deep scars - all the more because this took place among communities that had previously lived together and even intermarried. For centuries Bosnia has been predominantly Muslim and before 1991 there were only three known congregations in Sarajevo. Now there are around thirty, some in places where the worst atrocities had taken place, with about 700 people attending services. These infant fellowships are evidence that there is no place so dark that God's love cannot shine.